Da Capo Lifelong Books, 9780738212746, 240pp. Holidays? Check. Birthdays? Check. Tuesdays? Check! Our research says life is 100% better any day pie is involved. There’s nothing like a rich, gooey slice of apple pie straight from the oven, baked in a perfectly flaky crust and topped with cinnamon-sugar. And now it can be yours, along with dozens more mouthwatering varieties, vegan at last and better than ever. Learn how to rock (and roll) the perfect pastry crust, whether butter, graham cracker, chocolate cookie, or gluten-free almond. Luscious toppings transform your pie into a showstopper. And you’ll even find handheld treats, to make getting your recommended daily allowance of pie more convenient! 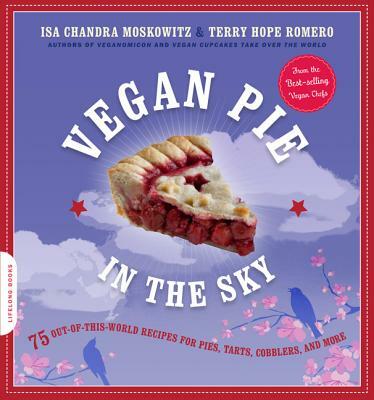 With gorgeous color photos and Isa and Terry’s irreverent commentary throughout, Vegan Pie in the Sky is the modern baker’s bible for pie that’s out of this world. Isa Chandra Moskowitz & Terry Hope Romero are award-winning vegan chefs and authors of several best-selling cookbooks, including Veganomicon and Vegan Cupcakes Take Over the World. They have been featured on the Cooking Channel, NPR, in Saveur, and more. Visit The Post Punk Kitchen at www.theppk.com.